Avery Weigh-Tronix Pre-Fab Truck Scale Foundations, in either steel or concrete, can be set into place in a matter of Hours. A Pre-Fab foundation can cut time and labor from your next truck scale installation. Just unload, assemble and start weighing. The Avery Weigh-Tronix Pre-Fab foundation is specifically designed for use with the BridgeMont (except LP-8) and SteelBridge XT series truck scale products. The Pre-Fab foundation was developed for those customers who want the convenience and economies of a Pre-Fab steel foundation. The Pre-Fab foundation assembles arrive at the job site in factory assembled kits. Module kits are available in 1, 2, 3, 4, or 5 module configurations. Kits will accommodate either 10' or 11' wide sizes. 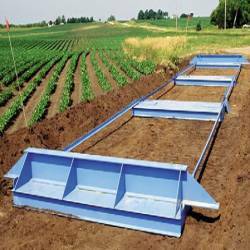 Pre-Fab foundations are not recommended for any permanent installations where frost heaving is a problem or there is not a solid base.